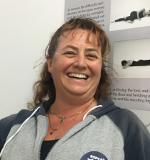 Jenny began Teaching with the Marion Modern Dance School and the YMCAs in Canberra 30 years ago. Then after a car accident that sidelined her for 7 years, she started her own hobby Dance School in Brisbane which ran for 13 years teaching Jazz, Tap and Ballet. ‘Jenny’s Dance School’ encouraged students to perform at as many school fetes as we were welcome to attend, to prepare for competitions in Eisteddfods and the annual Syllabus Competition, as well as take part in Exams and our Annual End-of-Year Concert. During this time Jenny also worked with a local primary school as some of their students wanted Dance as their sport activity, finishing with a performance at their annual fete; with a Theatre Group for their staging of The Pajama Game; and with a local church’s youth group. This group ran classes for kids who couldn’t afford most activities with a mini performance every 5 weeks. Jenny relocated to Canberra in 2013 and began teaching for Canberra Dance Theatre; Dance Edge with Jazz and Contemporary; MAKS Ballet with Jazz and Contemporary; and Dare to Dance teaching Tap, Classical and Contemporary; Dance Edge in Kambah teaching Jazz and Contemporary; and Maks Ballet with Jazz and Lyrical Contemporary.